So many things to colour, paint and create... not enough time! I think most of us feel this way. There's always been amazing books to colour over the years... Pixar, The Muppets, Winnie the Pooh, Tarzan and flowers, fairies, wildlife and mermaids! But now there are even more! This time promoted towards the adults that look after our inner child... more mermaids and fairies but also mandalas, zentangles, doodles, animals, flowers, gardens, forests and geometric anythings! The list of newly published books is almost endless... so I've limited my shop to just thise I truly love and think we'll gain the most therapeutic colouring time. Our time is precious, so its all about quality colouring time, not quantity. 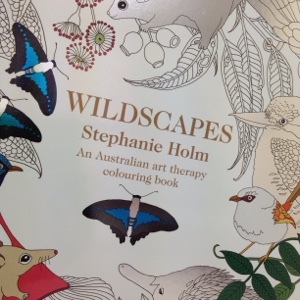 One of the newest books is "Wildscapes" by Stephanie Holm. Australian unique and diverse animals, plants and insects themed by habitat - from desert to rainforest to heathland. Its simply gorgeous. I love every page! The paper lends itself to pencils, paints, crayons, gel pens or markers... anything at all :) but bear in mind if you use too much ink, they may bleed through the page. But there is good news for colouring with textas (markers, Chameleon Pens, Copics, etc)... if you spray a light coating of fixative on the page first, it helps stop the bleed through. I've yet to test it, but in theory it makes perfect sense. My can of fixative is solvent based so only suitable for waterbased pens. An acrylic fixative or sealer should be used for solvent based markers. 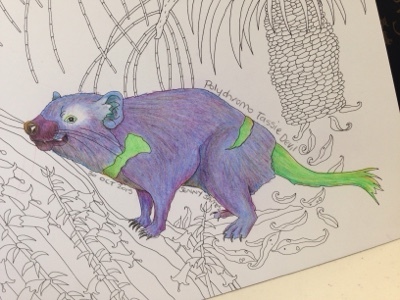 Tbis adorable Tassie Devil was coloured this morning using Faber Castell Polychromos coloured pencils. Its a small tin of 12 so its was good to stick to the basics and mix my own colours. Have a happy creative day!